In an isometric exercise, a force is applied against a resistant object, so that even though tension builds in a specific muscle, there is no movement. You can do isometric exercises to strengthen the muscles of your neck. For each exercise, keep your neck straight and look straight ahead. To exercise muscles at the right side of the neck, put your right hand against the right side or your head above your ear. As you press against the side of your head with your hand, also press your head back against your hand. You should feel the muscles at the side of your neck tighten, but your head should not move to either side. Press firmly, but not quite as hard as you can. Hold for about 6 seconds, rest for up to 10 seconds, then repeat. To exercise muscles at the left side of the neck, do the same steps as in the exercise above, but press your left hand against the left side of your head. To exercise muscles at the back of the neck and upper back, lace your fingers or put one hand over the other and place your hands at the back of your head. 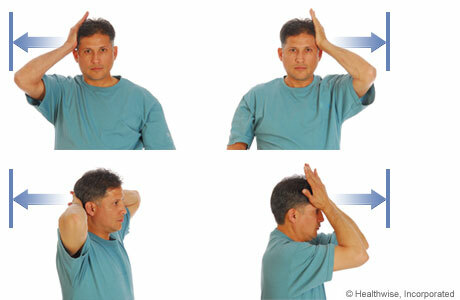 Press your hands against your head at the same time you press your head straight back against your hands. Press firmly, but not quite as hard as you can. Do not tip your head back. Hold for about 6 seconds, rest for up to 10 seconds, then repeat. To exercise muscles at the front of the neck, put the heels of both hands against your forehead just above your eyebrows. Press your hands against your forehead at the same time you press your head against your hands. Press firmly, but not quite as hard as you can. Do not tip your head forward. Hold for about 6 seconds, rest for up to 10 seconds, then repeat. Repeat each exercise 8 to 12 times. Talk with your doctor or physiotherapist if you have questions about how to do these or any other exercises.